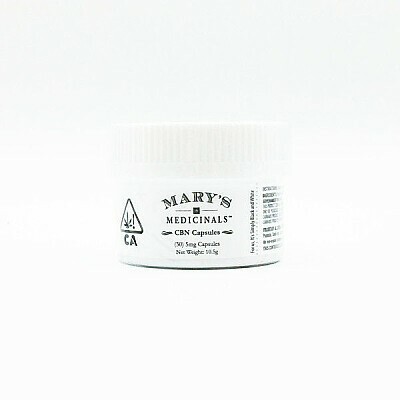 Mary's Medicinals CBN capsules contain 5 milligrams of CBN plus three terpenes known for their relaxing effects. Research has shown that 5mg of CBN is as effective as 10mg of diazepam and other similar pharmaceutical sedatives. CBN potentially has a variety of effects on the body that we could benefit from, such as antibacterial and anti-inflammatory effects, pain relief, anti-insomnia and anti-convulsive effects, act as an appetite stimulant, and as a promoter of bone cell growth. Mary's capsules are 100% plant based, vegan, and non-GMO. Enteric coating protects the contents of the capsules, ensuring high bioavailablity. 30 count of 5mg capsules.